Half time in Sochi! After an exciting sixth game and a quiet restday on Sunday we re heading into the second half of the match. Without further ado, let’s go to the tweets of game number seven. As always, many tweeters predicted the opening: @bennedik, who obviously loves the Sicilian: “My prediction for game 7: 1.e4 c5 2.Nf3 e6 3.d4 cxd4 4.Nxd4 a6 5.c4 Nf6 6.Nc3 Qc7”. What do you think, @nigelshortchess : “No need to panic for Vishy . A draw would be a good result today. He still has time”. In an interview with German magazine TV Spielfilm in 2004, US actor David Hasselhoff was quoted as saying, “I find it a bit sad that there is no photo of me hanging on the walls in the Berlin Museum at Checkpoint Charlie” – a comment he later denied having made. Back to the game….. is black still ok? @Jonathan_Rowson: 28. Ng3. Tense. No exchanges any time soon. Could be one of those games that seems deadly dull until it completely catches fire. @nigelshortchess:” It is a surprisingly awkward position for Anand, despite the limited material. The odd imprecision and he could be in trouble”. @ecm_man: “Kasparov was a killer, whereas Carlsen is a torturer on the chessboard”. Norwegian chess reporter @TarjeiJS is getting nervous (or bored) and shows us around the venue: “Taking a walk outside the press room”. @athreyaa:“No No No Vishy – You were supposed to play Ne5 in the last game. Not today. 😀 :D” and @GMJanGustafsson agrees: “I can’t shake the feeling Ne5 was a better idea in game 6 than in game 7”. @balaajim: “The irony Ne5 would have won the last game, this time it could be the losing move”. @Chessnotes: G7: If you need real entertainment laughs, watch engine evals wheeling around trying to get a handle on this position. @spandalai: “Its a war of attrition. 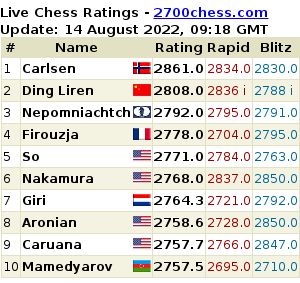 Likely draw, but with Carlsen you never know. Intriguing stuff”. @vermynhath:“Why are people moaning – “dry?” “arid”???. If you cant enjoy this, take up draughts.This is chess at it’s purest. Fantastic”. The game went on and on and on…..
@erwinlami: “Very impressed with the tough decision of going 70…bxc4! and absolutely sure that Vishy will be holding this game now”. @therealLOTR: “After this game ends in a draw, I hope someone from the audience kicks MC in the nuts for wasting everyone’s time for so long”. @Berlin_Endgame: “I’m willing to bet, btw, that those who are complaining about Carlsen playing on have never had to hold anything like this in a serious game”.